A fever can cause you to sweat and lose more water than normal. Fevers can also cause you to feel so sick that you don't want to eat or drink anything at all. When you are sick with the flu or any virus, make an extra effort to drink water to prevent dehydration. 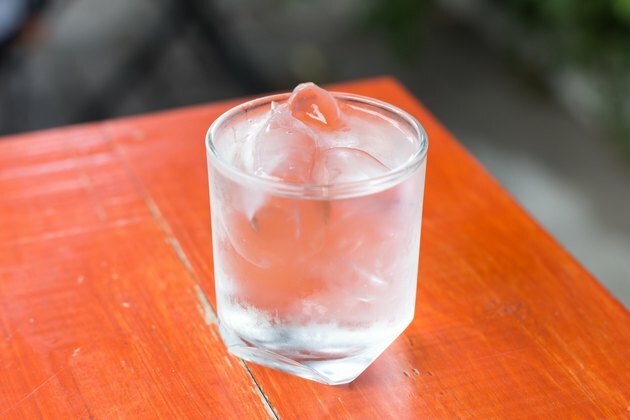 Ice water not only helps you stay hydrated, but it can also cool you off. Calculate the amount of water you need per day. Dr.Sears states that adults need ½ to ¾ oz. of water for every pound of body weight. This water requirement encompasses all liquids and even soups and fruits that contain water. Fill a large cup, reusable water bottle or other container with ice water and keep it near you. Fevers often cause a decreased appetite because foods seem to lose their taste. Ice water provides a refreshing and hydrating choice when other beverages such as juice and sports drinks may not seem palatable. Take sips from your water bottle at least every 10 to 15 minutes while you are awake. Avoid drinking the water too quickly, especially if you have been vomiting. Drinking water slowly but steadily may help it to be absorbed more easily without triggering your body to empty the contents of your stomach. Refill your water bottle as needed and refresh the ice to keep it cold. Ask someone to do it for you if you have a high fever or you just don't feel well enough to make trips to the kitchen. Contact your doctor if you are unable to keep the ice water or other fluids down. Becoming dehydrated can cause an electrolyte imbalance within your body that may need to be treated with IV fluids.